Serving the community since Friday, May 18th 2001. In the mean time, please read our Tales of Woe below. 2007-01-24: It has recently come to our attention that our contributions address has not been functioning properly, in all likelihood for as many as several years. Our embarrassment is profound. We are once again accepting new Tales and look forward to hearing from you. Squirrels or chipmunks have been wreaking havoc on our two Honda Civics and Suburu Forester. They appear to prefer Hondas since they most often feast on them. We tried moth balls. My mother who lives with us (one of the Honda owners) is freaking out and convinced that my husband's bird feeding addiction is attracting the squirrels. We live on the edge of the forest. This problem has caused us much grief and cost us thousands of dollars as well. Do I tell my husband to stop feeding the birds (and squirrels?). I'd love to find a solution. We finally caught one chipmunk and relocated him to the state forest, but our catch rate is very slow! As in, we've caught only one chipmunk. 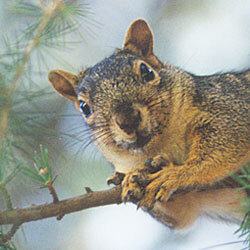 Both of my vehicles were in the shop last week for squirrels eating our wires. We have a 2004 4Runner and 2000 Subaru Legacy. They did $1,400 worth of damage. We were told Pepper Spray which you can buy at a local gun shop. We ran out after spraying one car and now, the 4Runner has all the lights up on the dashboard again. The car goes in the shop tomorrow for more repairs. We need help - what can we do to prevent this from happening over and over again! Has anyone had any luck using Shake Away? We have two Honda Civics that are being eaten alive by squirrels! Perhaps a fox terrier? I HAVE 2 JEEPS ( 1996 SPORT CHEROKEE AND 2002 GRAND CHEROKEE) THAT HAVE BEEN ATTACKED A TOTAL OF 7 TIMES TOTAL COST TO DATE ABOUT $ 2000.00. I HAVE BEEN SPRAYING CAYENNE PEPPER LIQUID INTO THE ENGINE COMPARTMENT, BUT NOW THEY ATTACK THE BACK WHEEL WELLS AND EAT THE WIRING . DOES ANYONE HAVE A SOLUTION. THEY EVEN MAKE NESTS IN THE WARM ENGINE !!! For the 2nd time in 6 months Squirrels have eaten the insulation from the hood of my Passat. This time they also chewed through the brake lines, electrical wiring and oil hoses. It is undriveable..... Where do you put the mothballs and how do you secure them? Do they make the inside of the car smell? My vehicles have been attacked on 6 different occasions. I have two vehicles which means one of them sits in the driveway. Although my Trailblazer is only 2 years old and has been attacked 5 of 6 times it's the Grand Vitara that has suffered the most expensive/extensive damage. My last reported damage happened in only one day. They built a nest and basically took up residence under my hood. Their last nest was built using the stuffing from my neighbor's patio furniture. The cost of damages has ranged from $200 to over $2000. My insurance covers the damages minus the deductible but it doesn't help my peace of mind. It's really sad when nature's creatures and civilization can't live in harmony. My 2003 Honda Element was parked on the seventh floor of my office building garage since early morning last Friday. I left near midnight and mine was the only car there. Upon reaching the ground level, the malfunction light came on. Honda manual said to check the gas cap; if it was loose, drive three days and light should go off. Also, the "D" (drive) light started blinking. I took the car to a dealer and was informed that something had eaten my wiring, and it will cost about $1,100 to rewire! I do not know whether it was squirrels at the house or rats in the garage, or both, that ate the wiring. I have been having my car in the garage a lot lately because of work. The insurance adjuster had heard of the squirrel-eating-the-wires problem. I am wondering why, if it is a known problem, something is not done to protect the wiring to avoid this. I notice one of your readers had a Honda Civic with the same problem, and he put a box of mothballs under the hood. Can you tell me just how/where to do this? My son who is serving his flag in Korea decided to leave his car here in the mountains of Colorado instead of the airbase in Phoenix. I told him I would take care of it, drive it once a week and all that. Well, this winter as I warmed it up I found an odd light on the dash, but it still ran. Then I noticed that the battery light was on, odd. Then one day after a big snowstorm I decided to try his Toyota four wheel drive. It would not move. The 4wd drive made lots of noise but I could not move the car. Later that week the battery went dead. And then I opened the hood and behold, a nest and not much wiring under the hood, much wiring on the ground. And, they even tried to eat the battery. Well, $1700 later it runs now and I bought cougar urine to spray on the car. It works but male cougars are hanging around from time to time making eyes at the Toyota. The squirrels have gotten into 3 of my vehicles......what is the best way to keep them out !! Do the electronic devices work? Squirrels at SUNY Albany ate through my sensor wires and now through my headlight wires. I just spent the better part of the day trouble- shooting and repairing my head light wires on my 2000 Grand Caravan Sport. I'm told there's something Chrysler cars that attract the Damn squirrels. SQUIRRELS Take notice, This is War!!!!! We bought our new Hyundai Santa Fe (2003) the day after Thanksgiving. That wednesday, I went to get the kids at school and the car put-putted in the driveway. Car was towed to the dealership where it turned out the squirrels chewed thru the electrical holster (a bundle of wires). Since the car was so new, it took a month to get the correct part. We had to have it covered under our insurance ($500 deductible) since "squirrels" are not covered under their bumper-bumper warranty. Hyundai is doing the right thing by reimbursing us the deductible. They feel really bad that this happened to a 4 day old car!! We had the car back for 25 days, and it happened again. This time the damage wasn't as bad and we had changed our deductible to $100 but it was still a $300+ job to fix it, and I lost my car from Thursday to Tuesday. Needless to say, we started trapping (Havahart traps) and transporting the squirrels 10 miles away and over a river. We just released #15 this afternoon and we do not live in a wooded area. We are in a nice little suburban area w/some trees. The only way back to our area is over the bridge or by swimming. I have nightmares of troops of squirrels marching back over the bridge to my car. What kills me is that there are 6 houses on our block, each house has 2 cars. With 12 cars to choose from, why did the squirrels choose mine, twice?!? The little scoundrels did the same thing to us! Our van was starting to act like "Christine" ... turns out warranties don't pay for the damage. Does anyone know a good defense for those of us who don't have access to an enclosed garage? I like the pepper spray idea as long as that doesn't get ventilated into the car. I'll keep checking around the internet and if I find something promising I will post it. I hate to admit it - I still think the little devils are cute, so I don't want to hurt them. Just want them to live in the trees instead of in my car. This evening I noticed our patio lighting wasn't on. It had rained recently and if the transformer gets wet the GFI trips. I went outside, in the dark and fumbled around by the socket to find the GFI button. As I pressed in the button, a Blinding flash and loud pop assaulted my senses and scared the you know what out of me. After squealing for my husband, we turned on the porch light to have a look. It looked like the cord had exploded, with pieces of it everywhere. However upon closer inspection we could see that there were chewed sections all over the cord. So the explosion was secondary to the squirrels chewing. I was very lucky that my hand didn't come in contact with the exposed wires. It's too bad the power wasn't on when their little teeth cut through. I went to St. Louis, Mo. this Memorial weekend on vacation. I'm an electrical contractor, and drive a service van. Well, when we got home and I went out the next morning to start my truck, everything was fine, it ran a little rough. Five miles from home, it quit. I removed the bonnet while waiting for the tow truck, and found a garden of leaves, nuts, and seeds. Enough to fill a five gallon bucket. This is the third time this has happened. They ate the wires to the computer, spark plugs, and ignition. This is Squirrel War. And I hope to win. I hope? The squirrels invaded my Honda Civic and ate all the wiring! At first we didn't know it was squirrels. The lights stopped working and when I went to replace them all the wiring was disconnected. We fixed it and two days later again there were no headlights. This time we had to buy replacement parts because the wires were too short to fix. We ordered the replacement parts and they finally arrived on Sunday. So after church we lifted the hood and a squirrel ran out leaving a baby behind and even more wires chewed. The next day I drove it without lights to my son's school and the car overheated. I guess one of the wires was to the electric fan that cools the motor. I had it towed to a local repair shop and called my insurance company. Luckily I had coverage so I only had to pay $100 for the deductible. The mechanic told me to put mothballs under the hood so I did (A whole box). So far I have had no more squirrel damage. Well, stupid me! I thought mice were eating my insulation and had Orkin set out poison, but it happened again, and again! After paying to have my wiring replaced for the 3d time, we discovered it was squirrels. I used to like squirrels. I used to think they were cute, but now I HATE SQUIRRELS! They eat up my birdseed and they eat up my wiring. They are regular pests! I don't even think they're cute anymore. It's no more Ms. Nicebunny! We've declared war on our attic squirrels. Eve and I were miffed when they ate the electrical wiring and crashed our computer for 3 days. We're fed up with huddling in our box in fear while they throw their wild parties and frenzied feuds. We were terrified by Esther's accounts of the Great Squirrel Invasion, when they broke through the kitchen ceiling and tried to take over the house. Patrick Christmas, a lawyer, resorted to squirrel-bashing when they invaded the attic of his home in Washington DC and chewed through electric wiring. He dressed for battle, donning a hockey helmet, mask, gloves and padded jacket. He then pursued the pests on the roof of his three-storey house and started swatting. "All I could think of was being found dead at the bottom of my house, wearing a hockey mask and a ski parka in August," said Mr Christmas. The squirrels are still there. © Copyright of Telegraph Group Limited 2000. Round Table Discussions, Item 6e. The squirrels at FL have gotten out of control. There have been several damaged cars and some of which had to be towed from the parking lot due to the amount of damage incurred. UCAR hired a pest control company, which set traps for them and then relocates them to another area. They seem to be worse on the north side of FL-2 and west side of FL-3. i) It was suggested that pepper sauce might help. ii) Mothballs may also help ward off the little critters. iii) A local vet commented that they are such a problem this year due to a population explosion. Both Tom Warner and I are the victims of varmints who made themselves cozy under the hood of our vehicles and ate, at least in my car, all the wiring--the car is undriveable and will require extensive rewiring. For me, this happened in ONE DAY in the west parking lot outside Human Resources, in the group of spaces where the electricians park the NCAR vehicles closest to the doors. Tom was parked along the bank in front of the railroad tracks.